It’s all about the currency crosses on today’s canvas, as we play around with forex trade opportunities on EUR/JPY and AUD/CAD. Check it! 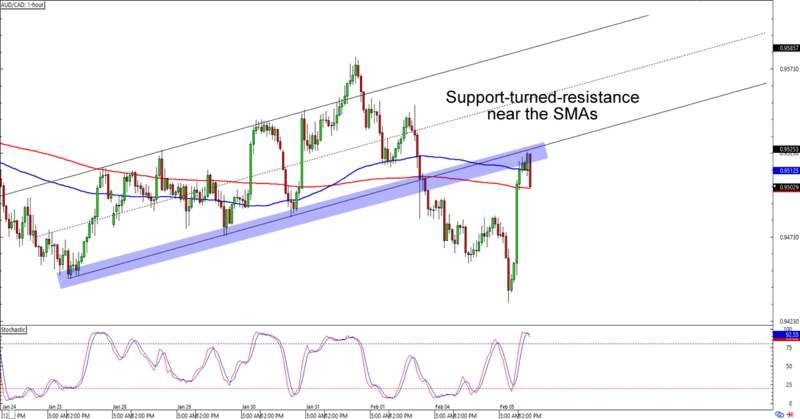 AUD/CAD looks like it’s about to turn away from the .9525 handle, which isn’t surprising since it lines up with the ascending channel support that it had broken in early February. Not only that, but it’s also near where the 100 and 200 SMAs are on the 1-hour time frame! This angry red candle we’re looking at indicates strong selling interest, so y’all could short at current levels if you’re feeling confident and aggressive against the Aussie. If you’d rather wait for confirmation of a bearish momentum, though, then you could also wait for a couple more candlesticks before you enter. In any case, the previous lows are still one or two (or a hundred) pips away, so you’ll still get a good reward-to-risk ratio. Whichever strategy you choose to use, make sure you’re stretching your risk management muscles when you execute them trading plans! Comdoll trading not your thing? Here’s one for ya! 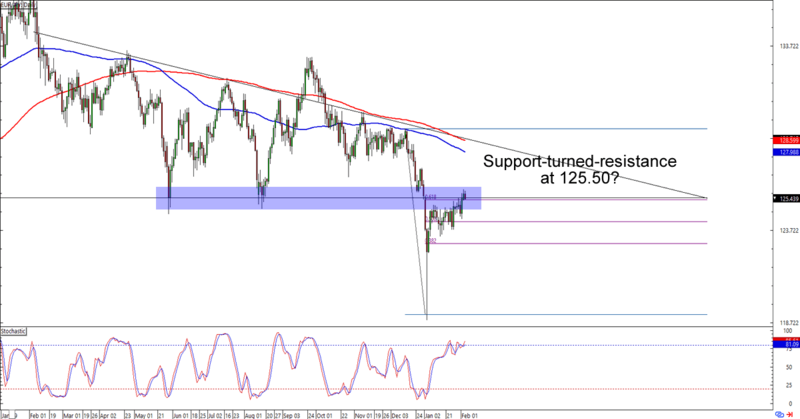 EUR/JPY is trading around the 125.50 levels, which is right smack at a 61.8% Fib retracement AND a broken descending triangle support on the daily chart. Will euro bears drag the pair back to new 2019 lows? Or was the previous months’ spike lower just a fluke? The previous lows near 121.00 or 119.00 are good spots to aim if you believe that the euro will see more pain against the yen over the next couple of weeks. If you’re one of them euro bulls, though, then you might want to wait for a break above the 100 and 200 SMAs before you commit to a strong and sustained bullish momentum.